after a career in life..... my wife and I purchased 15 acres of an original 50 acre farm that was established in 1920. We are designing and building a homestead that will sustain a cooperative environment of teaching and learning a regenerative lifestyle. 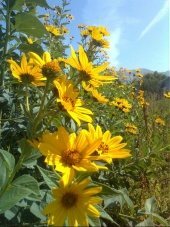 I use the sunchoke/jerusalem artichoke as a supplemental food in my livestock feed cycle. The rabbits love them as they love turnips. I thought that I might be cutting my efficiency by using the paver sand. I've only used 3 bags worth so I will excavate that and use it in the red clay/cob mortar. Then I will fill the voids with the red clay instead. On the 6" core to 8" heat exchange duct, there is more. At the end of the 8" HE Duct run I reduce back to 6" at a 90deg bend up for 12' and a 45deg bend to take the chimney out of the greenhouse. The HE Duct is 21' long including 1 U-Bend and 2 clean-outs. My thought on going to 8" HE Duct was two-fold. 1.) I was given about 30' of repurposed 8" duct 2.) I figured that I could create a greater heat exchange by increasing the size at the HE Duct and then reducing the chimney to 6". This duct sizing seems to work fine, I don't think it is impeding the flow of gases or decreasing the available heat. Maybe the 6" straight thru would be more efficient but the 8" seems to work fine. I can't wait to finish all of the mass and get my first burn with a full mass. The base of this thermal mass starts with 4" thick x 12" x 12" chunks of concrete slap as the foundation, then the heat exchange ductwork on top of that and bricks, paver sand fill between ductwork and more of the concrete slab chunks on top of that then I will run a coarse of brick about 4" tall, brick turned sideways then fill in with more paver base sand and then I will finish with a flat surface of 18" x 18" landscape pavers. This mass will ultimately hold at the surface 5 - 55 gal plastic drums full of water for additional mass and heat transfer. We are using chunks from that same demoed concrete as the face of the mass. I have also used repurposed bricks on the face of the mass to give it some dimensional shape in preparation for the top surface of the mass. again using landscape pavers from the big box as the surface of the mass and put them on level. I am building up one course of brick above the sheet metal duct and fill in with paver base. I am thinking that this will give me a solid enough base for the surface in order to hold the 2,282.5 gallons of water in the barrels with zero deflection at the surface. I am also using river rock around the barrel simply for aesthetics. I am realizing something at this point of the build. It is called spacial cognition..... meaning that I sometimes have a challenge seeing in my minds eye just how big or small something will be as the end product even though I use tape measures and levels..... At any rate I am attempting to build in sufficient foundation. We don't want to crush the sheet metal heat transfer ductwork. I am using a mud mix that I call "Cob Mortar". Since I have an abundance of red clay I start with a mixing tub 1/2 full then I add a bag of general purpose sand or .5 cu ft. then I had 1/3 of a $5.00 bag of cheap mortar mix from the big box. Using a hoe I mix thoroughly, good work out. Then I let it set for 30-45 minutes and give it another good mixing with the hoe and shovel. If it was the heat of summer I would use it immediately but I am working in a fluctuating lower temp inside the GH. I have basic brick laying skills nothing fancy but I know the consistency that I am looking for and I know how to put icing on a cake. BTW - I had to stand on a ladder and use the top lip of brick around the fire chamber. With my weight and the surface area of the ladder leg, the brick did not budge, this was about 18 hours later after laying the brick. During this time of work on the mass the RMH is in continuous burn mode and it is working well. The mass is not complete so we cannot expect it to perform to it's full thermal properties just yet but it is beginning to hold some heat. Does anyone see a glitch or a flaw in the foundation design. I just want to make certain that I will not crush my ductwork since I have this amount of weight to handle above it at the surface. heat exchange duct - 8"
Test burn #1 was a fail. Heat riser was not sealed at the joint of the burn tunnel causing massive smoke blow back into greenhouse. Repair was made to heat riser and burn tunnel joint using fire and heat rated commercial mortar and more clay slip was added to all exterior joints of heater components at seams. Test burn #2 was more of a success. However, I think I'm experiencing too much smoke blowback in the burn chamber. I realize that the system is still in open air and not completely sealed off with the heat mass but here are my questions at this point. - is there an optimum length of burn tunnel. I've seen a lot of 24" tunnels so that is the length of this burn tunnel? - I don't see many folks using this fire rated red clay chimney liner as RMH material. Any ideas or experience, why??? Monday morning 1/18/16 7:00AM. Outside temp 27F, Inside Greenhouse temp 34F with no heat. - aahhh... clay chimney liner, I think I heard an expansion ---POP--- inside the riser barrel. Also, I see a crack forming at the corner of the burn chamber which is also the clay chimney liner. Sulfuric Acid in a RMH??? Just posted this ? to Ernie and Erica. What does the forum say? I have a natural system structure "green, chicken, rabbit, quail, duck, fish-house" about 700 sq ft. 12 months under construction, about 75% complete. I have done due diligence on the RMH, connected with yall thru the Wheaton World and paid money on the Kick Starter Package. I have scavenged, collected and purchased raw materials and I am now moving into build phase of the RMH. Last week I attended a Ginger and Turmeric Growers Conference at Virginia State University, I spoke with one of the presenters who has several multi-thousand sq foot high tunnels to grow his product. He runs waste oil heaters and discussed lots of problems..... Privately, I asked if he had considered using a RMH. At first he just stared at me with a quizzical look then I asked him if he was familiar with the technology which he replied of course. Then he began to express concern about how to manage the sulfuric acid by-product due to the combination of soot in the heater and moisture in the greenhouse, which was one of his problems in the waste oil heater system..... humphhh... I was blank because I had not heard you guys discuss that or did I miss it. I was under the idea that since all fuel and flue gasses were utterly consumed in the burn chamber and the exhaust stack that there was no residuals other than terpenes in the mass-duct and chimney.